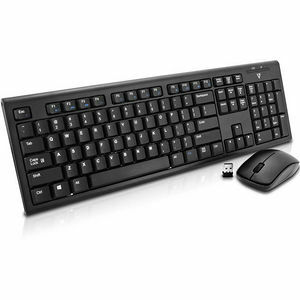 Enjoy wireless freedom with the V7 CKW100 Wireless Keyboard & Mouse from V7. Just plug in the USB wireless receiver and your mouse and keyboard are ready to go. Maximize productivity with the media hot keys to instantly access your files and more, plus the auto power saving mode gives you long battery life so you can go for months and months without changing batteries. The keyboard is built for comfort and durability - it's spill resistant, low profile and has adjustable legs. The included contoured, ambidextrous mouse is comfortable for hours of use offers precise control with 1000 dpi resolution.